I think only the mk3 needed a limiter on the steering lock, I've not heard of anyone with issues on the mk2. I wouldn't pay any more than £80 for a front and rear toe adjustment which is all that is available on the focus. Search online for a web site called align my car, all dealers on this site use the hunter proalign system which is the best in the country. My titanium X was built August 31st 2012 and it doesn't have sync, I placed the build order end of June 2012. Look on pumaspeeds web site, I'm sure the 4-2-1 manifold down pipe was the most popular. My 2003 focus had a 4-1 manifold bought from the states and a custom made decat pipe so I could change it over for the MOT. I also ran the o2 cheater device all the time to stop the management light coming on. 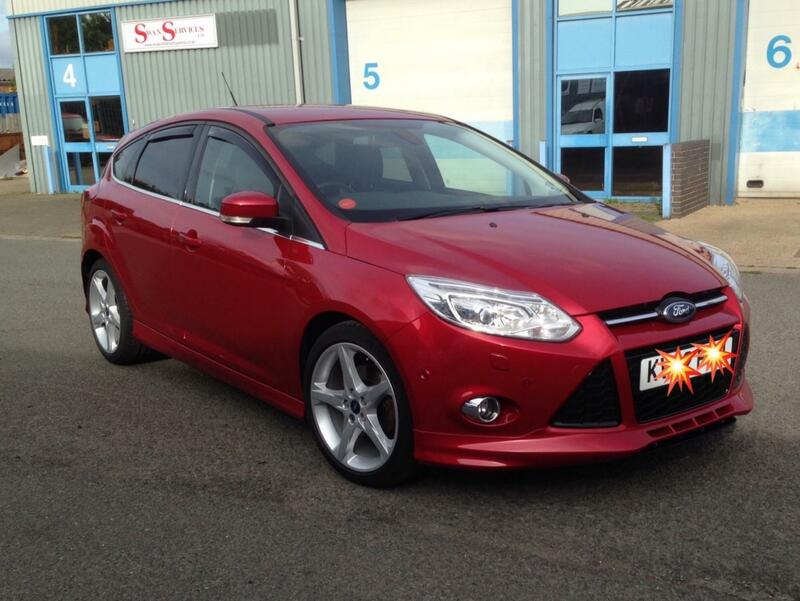 You can buy the replaced part from ford for about £20, it was a TSB for the st on vehicle built up to late 2007. I had to do both seats on my old st, my local dealer didn't really want to do it and once I found out how cheap the part was it was easier and less stress to do it my self. The seat is fairly simple as long as you remember how the mechanism comes apart. Easy, buy an add a fuse off eBay, 12v Socket, 7.5 fuse for the extra 12v socket. Plug the add a fuse into port f86. Cable tie underneath to existing wiring harnesses. Then just run your dash cam wire from the mirror to the left A pillar behind the trim and down behind the door rubber to under the glove box. I got a transcend drivepro 200. Seems to work well so far but I'm yet to capture any dodgy driving by people. It has wifi mode so I can view footage on my phone through an app. I would have bought the drivepro 220 but I didn't have a choice on this one as it was a present. It works on full hd and the exposure can be adjusted to help with getting a clear image. The only thing I've noticed is the front widescreen heater wires shimmering in the light. New car part accessories can be expensive, I think ford wanted to charge about £2500 plus painting to add the zetec s kit through the dealer, I done mine earlier this year and done front skirt side skirt and rear skirt bought from a dealer then painted at local body shop for about £1100. The prices on European parts are close to dealer prices. Like you found out with different bumper options u will need to get the right one, I waited a year and half before ford released the triangular front zetec s grill with parking sensors. The mountune gives you an inter cooler and the map is different which focus's more on torque than bhp and also keeps the original ford warranty. That's why it's more expensive, there are owners that have the bluefin so I suppose they will come forward and comment in time. You could do a turbo back system with sports cat, after doing my oil change myself I noticed that where the cat links the turbo they have open bolt slots so they won't rust and sieze like older cars so should be easy job but won't be cheap. No Rear End Grip On Tyres In The Wet. Dangerous! Guys be aware that the figures your looking at are only a very small insight to the complete testing tyres go through and all the gradings are done by the manufacturer. I've run continental, Dunlop and hankook on my old focus st and now with my current titanium X I've run continental and Michelin with both giving fantastic grip but the Michelin currently giving a better mileage return. Depending on what you want to pay for and whether grip or mileage is a factor, with my experience in the trade I would say grip would be 1.pirelli 2.goodyear 3.conti/mich 4.dunlop and mileage 1.mich 2.dunlop 3.conti/Goodyear 4.pirelli. Can't comment on Bridgestone as don't have many customers running them on mid to high performance cars. Some of the cheaper brands work well on different cars with different driving styles, I ran a pair of 13 inch budget Mohawks on a 1.2 fiesta for 13000 hard miles and when I sold the car they still had life on them so perhaps would of done 15k+, and one of my customers has an old Honda Civic running 14 inch Mohawks and he's had 30k out of the fronts. When it comes to grip you have to understand that they are cheaper for a reason so you can't expect an autogrip budget to work as well as a premium brand. I hope this helps anyone and that your local tyre dealers can give you enough advice to get you the tyre you need for your personal driving style and usage. If you remove it then u will need some more of the fixing tape that seals the line to the main bumper.